This adorable gift is just perfect for a physician's newborn baby. We fill a little wooden wagon with practical, doctor-themed items. Available in both a boy’s and girl’s version. Click on More Images above to see the girl's version. 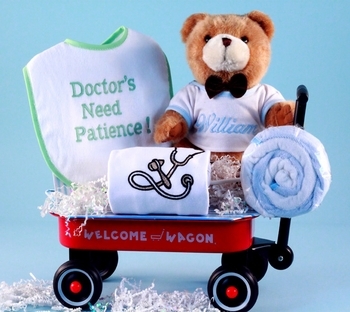 Set features a full sized bib that's embroidered with “Doctors Need Patience.” We then add a 10” white plush teddy bear and personalize it with the baby’s name embroidered on the t-shirt. We finish it off with 2 terry cloth burp pads arranged into a pink lollipop design and a 100% cotton onesie outfit embroidered with a stethoscope and reflex hammer. Note: the metal wagon in the picture has been replaced with a larger all wood red wagon. See More Images above to see the new wooden wagon. Processing Time Personalized: 3-5 business days.